We the Kings’ royal fan treatment – Live! Starring ... You! 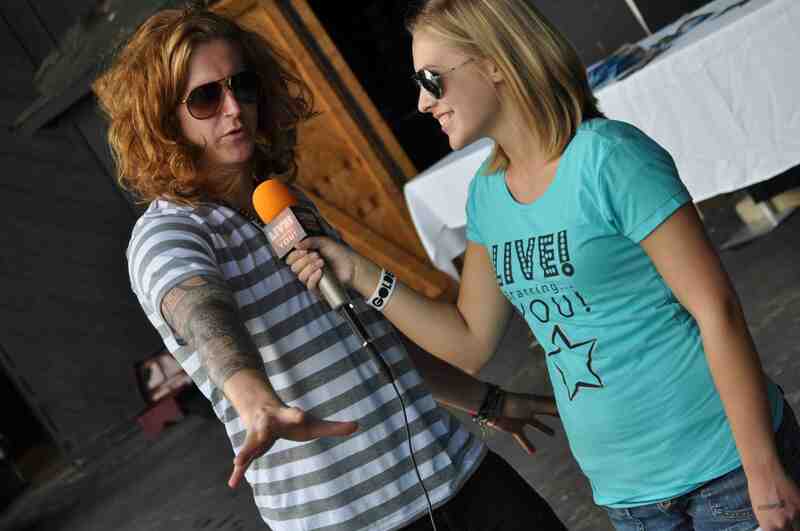 We the Kings lead singer Travis Clark with LSY! reporter Sarah Kingston. It’s something that you hear all the time: People in the spotlight are constantly thanking their fans for getting them where they are today. But saying it and actually showing such appreciation are two completely different things. When I caught up with the band We the Kings at Darien Lake Theme Park Resort in New York, I was able to personally see how much their fans truly mean to them. Since so many Live! Starring … You! fans dream of being in the spotlight someday, I think their example a good one for all of us. While waiting to do the interview backstage, LSY! founder Tim O’Shei and I decided that I should shoot some introductions to the interview while the band was doing their meet and greet in the background. (We do lots of these introductions – or what we call “stand-ups” – in different places and then pick which one works best to show all of you!). Little did I know that the guys were all jumping around and waving behind me! I didn’t know about this until I watched the footage later, but it goes to show that they really understand that when a camera is rolling, fans are eventually going to see it, and they want to show them that they really care! They know that through the footage that we capture, we are able to connect them to all those fans that weren’t at the show. As the interview with lead singer Travis Clark was just about to begin, drummer Danny Duncan snatched the microphone and started doing his own, very impromptu interview with Travis. No one could stop laughing at the pair! When I finally got the microphone back and began asking Travis questions regarding touring, fame, fans, and much more, every answer that he gave seemed sincere. He seemed truly interested in talking, and he had lots of great things to say. You should definitely check it out! The concert rocked, the guys gave the camera another wave as they ran off the stage, and my friends and I decided to spend some time in the amusement park. It had been a REALLY great day and I thought it couldn’t get any better. But it did! Just when I began to think he probably wouldn’t remember me because he meets hundreds of new people each day, he started talking to me about how great the interview was and that he hoped I could interview him again! And the sweetest thing was that he stayed out so much longer than he was supposed to because more and more fans kept coming over and he didn’t want to disappoint anyone. I know that he made me feel special as a fan that day, and I’m sure so many others felt that way too.